like airplanes, airports have stayed pretty much the same over the years. since first breaking ground in the 1920s, designs have employed a hub of passenger facilities to act as both a barrier and an entryway to a larger site of landing areas and utility buildings. aircrafts have operated through paved runways separated from urban civilisation, or at least in part contained, by the structural volumes of the airport itself. yet unlike airplanes this typology is not necessarily a necessary one. 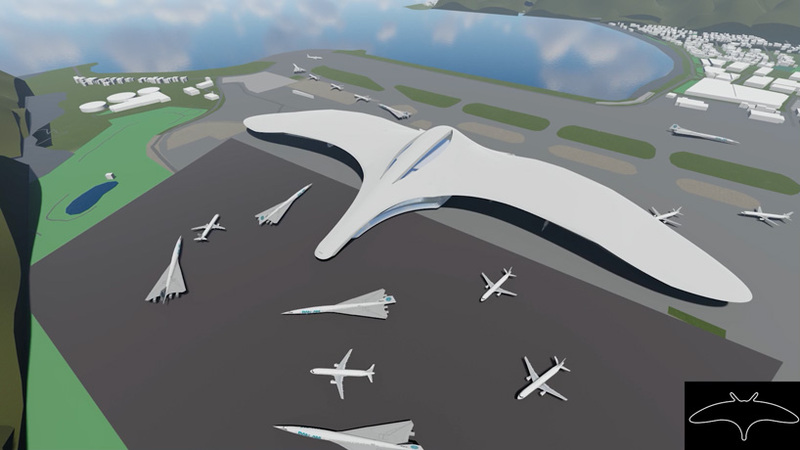 where a set of wings and aerodynamic design prove crucial for successful flight, altering the normative design of an airport could change things for the better. that’s the idea behind the european cultural center’s biennial exhibition which this year saw students from north carolina state university’s college of design work alongside curtis fentress of fentress architects, to propose concepts shaping the airport terminal of the future. students developed terminals for five global destinations: brazil, china, iran, madagascar, and new zealand. students worked on this project for 5-6 years, with each concept actualized through a series of architectural models and video renderings that fentress explained to the students were vital in winning airport projects. working in five groups they studied the culture, geography, and economy of each place to understand who they were designing for. instead of simply being a transportation hub, students considered the airport as a civic space, a small city of spas, hotels, restaurants, golf courses, gardens, movie theaters, art galleries, and gyms – a one-stop shop for people from all over the world. some students disregarded the flat urban landscape typology in favour of a central tower located in the heart of the city with the airport located on top. 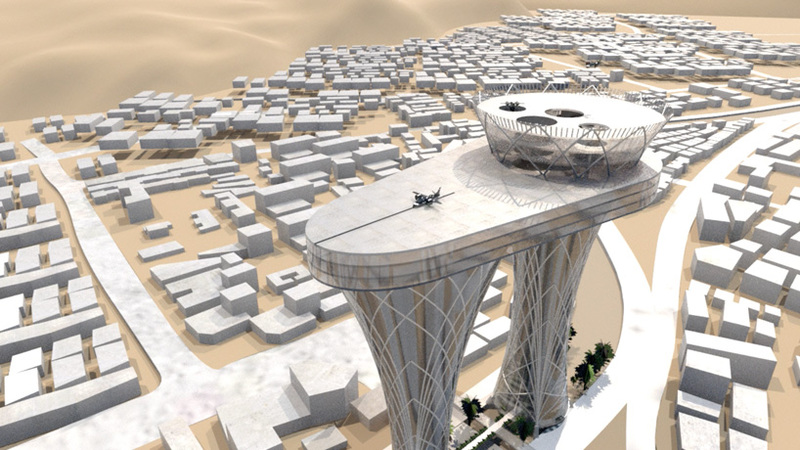 ‘we actually wanted to change the typology of what the airport is in this vision’, one student explains, detailing their response to an airport project in shiraz, iran. ‘rather than growing out in the middle of nowhere we wanted to grow up. we changed the building type and put the airport on top. now we can connect people a lot more easily by bringing them right into the cultural centre of shiraz’. the team designing an airport for rio explored the possibility of bridging the gap between the stark poverty and wealth in the country of brazil. meanwhile, a concept for an airport in wellington, new zealand, takes the shape of an underwater ray, mimicking the natural phenomenon of fish swimming beneath its rays to inspire airplane operations. an airport in nanjing, china, presents a drive through airport concept inspired by a torus knot, whilst one in madagascar enhances the passenger experience by inviting the island island into the airport. in the core of the latter visitors are surrounded by the flora of madagascar in gardens filled with native plants, and shops selling goods from local merchants. PLANE—SITE’s latest film from their series of short videos of the time-space-existence exhibition showcases this design collaboration. the studio has been honored by the european cultural centre‘s best architecture university project award 2018, for recognition of their studio work, ‘airports of the future: global design thinking.’ the award celebrates the studio on its contributions to the research, and highlighting of the significance of airport space, and the value of the experiential journey. the NC state college of design will be exhibiting student works from alumni distinguished professor wayne place‘s airport design studio in the 16th international architecture exhibition, the 2018 venice biennale, at palazzo bembo in venice, italy, november 25, 2018.